I have a wonderful recipe for a lovely rich chocolate cake that I wanted to share with the world. For this recipe you will need either a 7in round or 6in square cake tin. Lightly grease and line your cake tin. Beat butter, sugar and vanilla until light and fluffy. Add eggs one at a time, beating well after adding each egg. Fold in the combined flours, bicarbonate of soda and cocoa powder alternately with the milk. Spoon into the cake tin, smooth and bake for 1 hour. Test the cake nearer the end of the cooking time, insert a skewer if it comes out clean the cakes done. Leave the cake to cool in the tin for 5-10 minutes before turning out onto a cooling rack. Ensure the butter is soft, gradually add the icing sugar and cocoa powder and beat well, add the water and again beat well. Once the cake has cooled slice it in half and spread one half with the buttercream, if you want you can spread some jam on the other half, I chose Damson Jelly. I wanted to cover my cake with sugar paste so I could decorate it for a family birthday. So I trimmed the cake top so it was nice and flat, and then covered the cake with the rest of the buttercream. If you are not going to cover your cake then you may want to half the measurements for the buttercream recipe. Or any left over buttercream can be stored in the freezer. Next I rolled out some white sugar paste and covered the cake. I then cut out some triangles of coloured sugar paste and arranged them to create the bunting effect. Ta da! 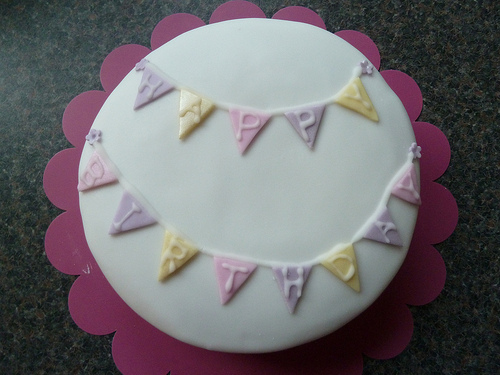 Here is the finished cake decorated with a simple bunting style Happy Birthday message. I need to work on the consistency of my piped icing as it was a little runny, but you live and learn. What a lovely cake, really like the bunting! Ilove the simplicity of the bunting decoration. I will certainly try this cake as I love chocolate cake and enjoy trying new chocolate cake recipes! how much cocoa for the cake? my apologies I've updated the recipe to include the cocoa for the cake.